Power take off on utility tractors have become a primary source for much of the work around farms, orchards, golf courses, etc. Any place where you need to turn a pile of branches into a pile of chips. You choose - self feed or hydrostatic hydraulic feed for infinite feed settings - these chippers mount on your three point hitch and hook directly to the PTO for quick setup and power on demand. Rotating 360 degrees, the 8 inch round discharge chute gives you accurate control over the flow of chips produced. The 30 x 1 inch thick, 275 pound dynamically-balanced disc, adjustable 4-sided anvil, four reversible chipper blades. The feed roller on Model CH9540H is 15 inches in diameter, containing 10 knife blades for enhanced powerful feeding. A hydraulic jack is mounted on the hydraulic feed system for ease of maintenance. 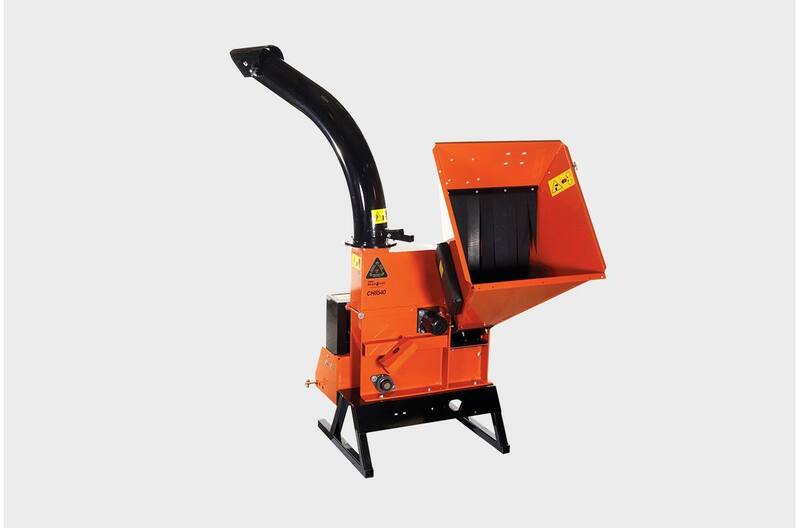 Plate steel construction means solid performance for hundreds of hours, and maintenance is enhanced by a hinged disc cover that provides wide open access to the chipper blades and disc. Rotor Size/Weight: 30 in.x 1.25 in./275 lb. L x W x H: 54 in. x 47 in. x 93 in.